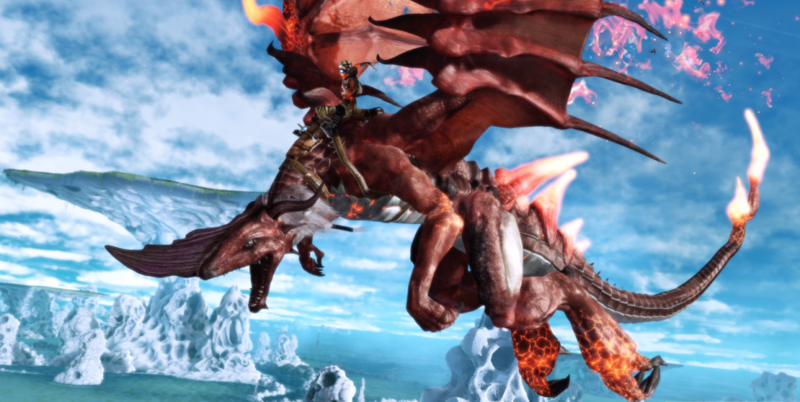 The last bit of news we heard about Crimson Dragon, the game being hailed as the spiritual successor to the widely popular Panzer Dragoon series, was that the PAX East 2012 demo had found its way onto the Japanese XBLA marketplace. This was, perhaps, a bit of fortuitous happenstance for the much delayed title as the project's director, Yukio Futatsugi, received a good deal of feedback about the game being Kinect only. It seems that folks weren't content using only some gestures and their voice to control their dragons, and preferred the tried-and-true method of using those twin analog sticks and face buttons. So, Crimson Dragon will no longer be Kinect only. However, that's not the only bit of news coming out of E3 about this co-op title. We had heard previously that the game would support three player online co-op, which it still will. In addition, the game will also allow you to play with your friends' dragons, even when they're not there. This form of asynchronous co-op is very reminiscent of Capcom's Dragon's Dogma, a game where you could pal around with your friends' "pawns" - AI controlled NPCs that take with them all the experience and loot they gather in your game back to the game of your buddy. It was a rather unique take on the whole concept of cooperative gaming and one that we may see implemented more and more as players' time can only be devoted to so many things. In case you missed it, here's the announcement trailer that ran during Microsoft's press event on Monday. This time with sound! The Xbox 360 version of the game has not officially been canceled. Microsoft is going to make an announcement about that, so I can't really talk about it. Our intrepid Co-Opticrew is hitting the floor again today and will hopefully have impressions of their own to offer up.